Spindrift racing is the latest team to sign up for the GC32 Racing Tour, for the Dr Martin Fischer-designed 32ft foiling cats. 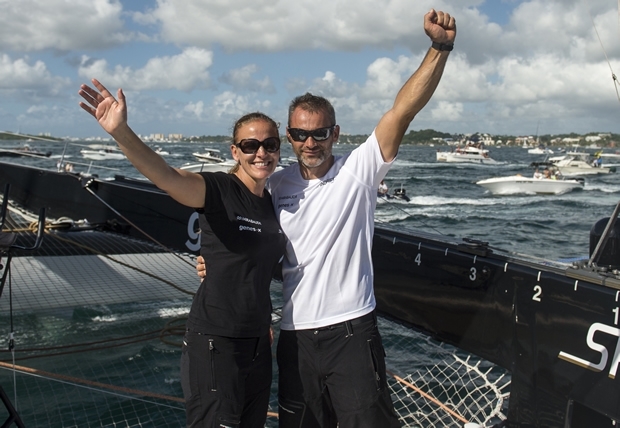 Dona Bertarelli and Yann Guichard's team has already announced its participation in the Tour de France à la Voile in July, this year to be sailed in Diam 24 trimarans, as well as participating for a ninth consecutive season in the D35 championship on Lake Geneva, where Dona Bertarelli will be at the helm of Ladycat. Meanwhile, followed Yann Guichard's second place in the Route du Rhum, aboard the 40m Spindrift 2, the world's biggest racing trimaran will be making its first attempt to break the Jules Verne Trophy record next winter. The team has been impressive by the performance of the GC32s, able to foil downwind in as little as 8 knots of wind and in stronger conditions, around 20 knots, to even foil upwind. Then there is the calibre of sailors taking part from Olympic champions and America’s Cup and Volvo Ocean Race veterans plus private owners, keen on the thrill of high speed wanting to experience the latest technology in our sport. GC32 Class President and former Olympic Star sailor Flavio Marazzi commented: “I warmly welcome the newest team, Spindrift racing, to the GC32 class. We believe we can provide Dona Bertarelli and Yann Guichard with one of the most exciting new boats that can be raced on a one design circuit at the moment. “It was great to hear that this internationally active and well managed team will enter the 2015 GC32 Racing Tour with their own boat. The team will enjoy very exciting races and experience foiling at its best in our class. “We want the class to be a family affair where owners, sailors, sponsors, event managers and friends can meet at regattas to enjoy this new and special form of sailing. The GC32 Racing Tour in 2015 will set the benchmark for the future. We start this year with some of best and most established teams in competitive sailing and looking forward to building up a strong series over the upcoming years. “We are looking forward to many more world class sailing teams joining our sailing series in the future.